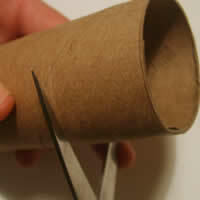 Cut your cardboard roll to your desired width for your serviette ring. 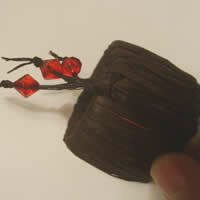 I have made mine 3.5cm wide. 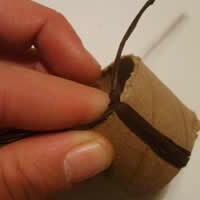 Take a length of raffia and tie it around the cardboard roll, with a double knot. 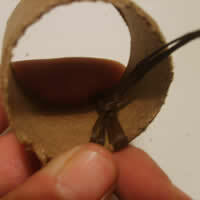 Pull the double knot to the inside of the cardboard roll, to conceal it. 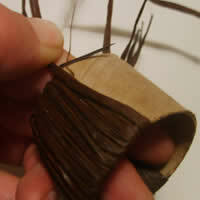 Continue to weave the raffia around the recycled cardboard toilet roll, until it is completely covered. If you run out of raffia, add an extra length of raffia by tying another knot and pulling it to the inside of your recycled cardboard roll. 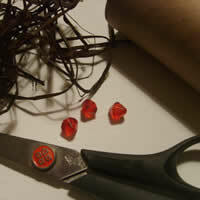 Thread one of your beads onto a loose end of the raffia, and tie a double knot below it to keep it in place. 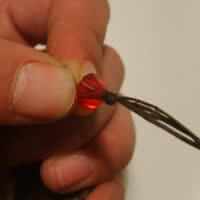 Add as many beads as you like, until you are pleased with the end result and all loose ends are eliminated. 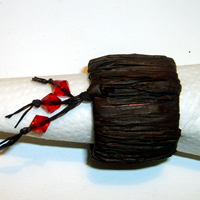 Your recycled serviette ring is complete.